Scientists at Michigan State University have invented a new kind of solar concentrator. The material is transparent, so when positioned over a window, you can see through it. Apart from windows, this type of power-generating material could be placed over mobile device screens, or indeed over any other flat, transparent surface. 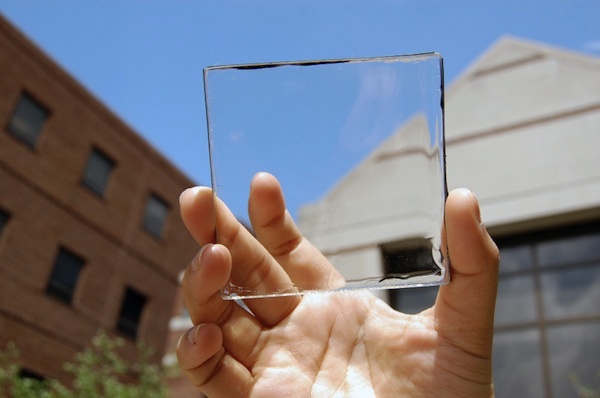 To be sure, this is not the first transparent material able to generate solar power. However, previous work in the area has so far resulted in inefficient energy production, and the materials have been highly coloured. This new material is clear and transparent. The issue has been that “no one wants to sit behind colored glass…like working in a disco”, Richard Lunt from Michigan State University’s College of Engineering has been quoted as saying. That said, the energy-producing efficiency of this new material is less than 1%, but the research team is aiming to reach efficiencies of over 5% when the process is fully optimized. The technology of transparent solar materials is still in its infancy. The best result for similar but colored materials is about 7% efficiency. The future benefits to the world of having transparent materials capable of generating solar power, cheaply and efficiently, are obvious. Many more applications for solar power become possible, and in a very nonintrusive way. For one, as Lunt points out, tall buildings with many windows could have solar concentrating material covering the sides predominantly facing the sun, rather than only on the roof. It will be a way of smartly integrating solar into buildings and objects, without people realising it is even there. That is the future. Image: Yimu Zhao. Solar power with a view: MSU doctoral student Yimu Zhao holds up a transparent luminescent solar concentrator module.